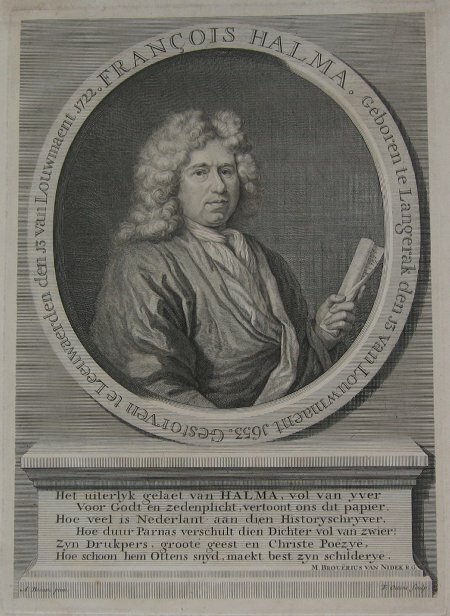 Dutch publisher and bookseller of Utrecht, Amsterdam and Leeuwarden. Born 13/01/1653 at Langerak. Son of clergyman, Reinier Jorisz Halma of Utrecht. First established business in Utrecht in 1674, later moved to Amsterdam 1699-1710 and finally settled in Leeuwarden where he died on his birthday, 13/01/1722. Reissued the 1578 Mercator edition of Ptolemy as Tabulae Geographicae orbis terrarum in 1695. Also published a work by Johannis Luyts [Utrecht, 1692], the Description de L'Univers [Amsterdam, 1700] & de la Croix's Algemeene Weereldbeschrying [Amsterdam, 1705], which all included the smaller-format Nicolas Sanson-de Winter maps, taken from the Utrecht edition of 1683. Other works included Geographia Sacra [Amsterdam, 1704] and a reissue of Schotanus à Sterringa's Friesche Atlas of 1698 [Leeuwarden, 1718].